2000AD comic Prog #228 (5th September 1981) | 'TAIN'T THE MEAT… IT'S THE HUMANITY! 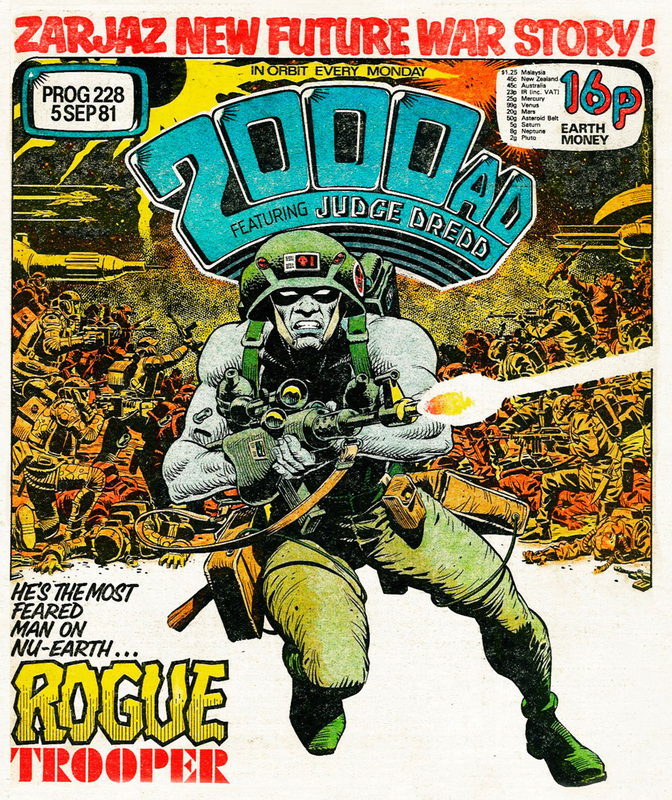 The cover to Prog #228 of 2000AD, the long-running weekly British science-fiction comic, heralds the first appearance of popular character Rogue Trooper, as drawn by Dave Gibbons. Written by Gerry Finley-Day, a veteran of British war comics who also penned The V.C.s and Invasion!, the strip introduced the blue-skinned genetically modified soldier who fights a seemingly never ending war on a battle-ravaged Nu Earth. The story was an instant hit and although Gibbons left the strip after a couple of months, he imbued the strip with a sense of dynamism that helped to cement the character as a firm fan-favourite. Gibbons artwork for the front cover is terrific. His image of Rogue, rifle ablaze, leaps out of a chaotic background of fighting soldiers while the white base leads the reader’s eyes into the image. In the mid-Eighties Gibbons would enjoy great success as the artist on Alan Moore’s groundbreaking Watchmen series for DC, and with artwork like this it’s easy to see why he was such a natural choice. Happily, the rest of Prog #228 was as well crafted as its cover. The issue kicks off with the Rogue Trooper strip, followed by Pat Mills and Kevin O’Neill’s Nemesis The Warlock. The final part of the classic Judge Dredd story Judge Death Lives came next. Violent future sport strip The Mean Arena followed with Alan Grant and Carlos ezquerra’s Strontium Dog rounding off a great issue. Coming soon: a great Robo-Hunter cover by Ian Gibson.